This issue will begin your trial subscription at the special introductory rate of only $89.99 for 1 year. You will also be able to access a sample digital issue of the magazine online in our subscriber area. PLUS, if you decide to subscribe, you’ll also receive our current Bonus Issue featuring our Readers' Choice Awards. Subscribers also gain full access to our Digital Issue section, where complete issues of the magazine (including Bonus issues) are available as PDFs. Subscribers also have access to our Digital Archive — over 30 years’ worth of articles, figures, charts and reviews available for download. 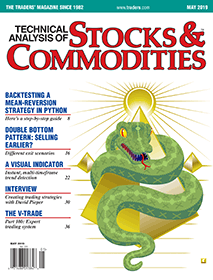 Finally, a full subscription to Stocks & Commodities magazine also includes full access to our online publications Working Money and Traders.com Advantage! See bottom of page for more info. 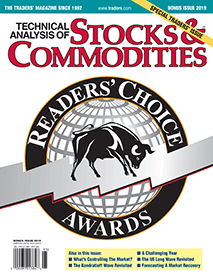 If you are not satisfied with your sample issue of Stocks & Commodities magazine, just return your bill marked “cancel” and owe nothing. The sample issue is yours to keep! YOU NEED TO TRADE SUCCESSFULLY.